Traditionally, German couples wear plain bands. If you're planning a German wedding or just want to celebrate your heritage, it's fun to learn about how German wedding ring traditions differ from those in the United States. For centuries, German couples have used wedding rings to symbolize their love for one another. The unending circle of a wedding ring represents the eternal nature of the couple's relationship. In traditional German culture, most wedding rings are very simple, often composed of a gold band and no gemstones, diamonds, or elaborate engraving. For many German couples, the wedding ring is also the engagement ring. To symbolize their betrothal, a man and woman exchange these simple bands. They both wear the rings on their left ring fingers during the engagement period. While couples in the United States usually wear their wedding rings on their left ring fingers, German couples move their rings after they say their vows. This practice can be confusing for foreigners, but it is perfectly natural for German brides and grooms. After the couple is married, they wear their wedding rings on their right ring fingers. Some German couples choose poesy rings. These rings are often simple gold bands with writing engraved on the inside of the ring. Usually, this writing is a bit of German poetry or a saying special to the couple. One common German poesy ring sentiment is "Myn Genyst," which means "my heart" or "my soul." You can also have a plain gold band engraved with the German saying of your choice. 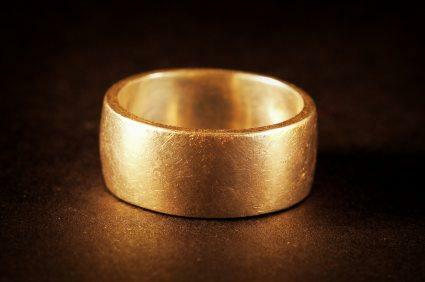 If you're buying a simple gold wedding band, be sure to compare prices. Do your research, and see which Internet retailer can give you the best deal on your wedding rings. Since German wedding tradition favors plain gold rings, you may have another shopping advantage. As a world commodity, gold fluctuates in value, and it may make sense to buy rings when the price of gold is low. If you have a long engagement, keep an eye on gold prices, and buy when you can get the best deal. Remember that you may need to have your ring resized before the wedding. For many people, the ring finger on the right hand is larger than the ring finger on the left hand. In order to move your ring as part of the wedding ceremony, you'll probably need to get it sized by a jeweler. This can typically take a week or two, so it's a good idea to plan ahead. Enjoy shopping for your German wedding rings. Jewelry is a lovely part of German wedding tradition, and it's a great way to show off your cultural pride.